Vito's Carvel on West Dixie and 130th in North Miami was the best. Great family owned place. We used to talk about how other franchises would cut the hot fudge with Hershey's syrup! Then the neighborhood changed- ice cream was out, and mullet, tilapia was in.. The shop became a Haitian Fish market..
Saturday night in the 60's: after dinner and the movies in the Gables, ice-cream sundaes or the large chocolate shakes at the Carvel on Coral Way. The ice cream log was also worth taking home! LNValdes, you are correct about 3090 NW 36th Street being the first Burger King. Thank you for catching that error. I'm sorry that I missed that comment being posted and I would have corrected it to keep others from believing it as fact. BK built a new larger restaurant to the east in the northeast corner of NW 36th Street and 27th Avenue to replace the original one and it carries BK #1 on their receipts. McLamore and Edgerton opened their first Burger King franchise location on 4 December 1954 at 3090 NW 36th Street in Miami. Rob MacMahon - I worked at that Coral Way Carvel in the early 1970's and Nixon would stop by while in Miami. Was next to the first Burger King ever. So many fond memories of waiting in line at "my" Carvel on Coral Way & 31st Ave in Miami. They always had a distinctive smell too. I brought my daughter to a Carvel in Silver Spring today in hopes of sharing those memories with her, but no cigar. The shop was inside a Jerry's Subs - no ice cream shop smell (instead the smell of greasy fries) and no unique, cool building :( The soft serve chocolate is still the best I've ever had, though :) Thanks for the memories McMahon Family! We also have "sweet" memories of the Carvel on S.W. 122nd Ave just south of the Tamiami Trail where we used to take our kids when they were little. I think that one is still there. Our neighborhood Carvel was located on E. 25th Street and 9th Ave. in Hialeah. We thought heaven had opened up and dropped it right there just for us! Ohh My God, I grew up in the Coral Way and 32 Ave area. I am 31 years old but I remember when I was like 8 or 9 back in 1987 or so...I would ride my Bike by there. The burger king was right next to it but it was on the east side of the parcel..it was later demolished and re-built on the west side of the parcel closer to the free-standing bldg that was Carvel. The Carvel later closed and moved accross the street next a Subway now. The bldg is still there but is some medical clinic or supply place. WOW!! I lived in N. Miami an Carvel was a half a block from the house on W. Dixie Hwy and 131st street. Spent a lota money there when I was in JR an SR high school! 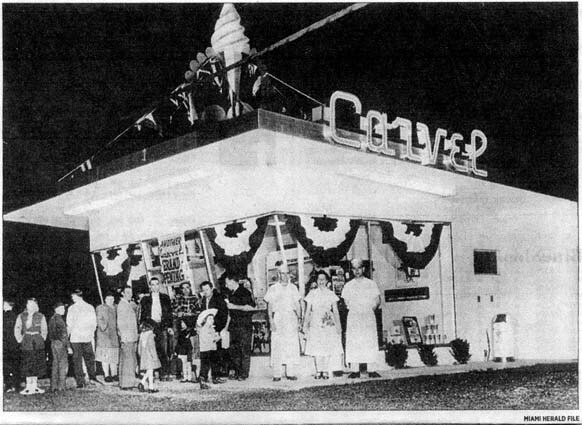 My parents owned the Carvel on Coral Way just east of 32nd Ave in the late 60's. Does anyone remember the Bob & Gladys MacMahon? Richard Nixon used to come there everytime he was in Miami. The Carvel I was always at is still located on West 49th/103 Street and East 4th Avenue in Hialeah, FL.